Mining for iron ore became important in this district in the 12th century, when monks came from Fountains, Byland, Roche and Rievaulx Abbeys. The Tankersley Ironstone Bed lies within the Coal Measure shales and is 35 cms thick. The monks worked this iron ore along its outcrop towards the north and east, from Bentley Grange, near Emley, which was the main centre of the iron ore industry. Old pit mounds show evidence of iron mining at Bentley Springs. In the early years of mining the monks used to dig either long trenches or bell pits depending on the depth of the ore. A series of holes or shafts was dug to the depth of the mineral layer and then the ore was extracted in all directions, forming a bell shape beneath the surface. When the likelihood of roof collapse was imminent the pit would be abandoned. The excavation of a new shaft would then begin a short distance away. Bell pit mining was the only method then available to reach minerals covered by layers of other rock. After the ore had been extracted it was taken to primitive furnaces called bloomeries, situated near to the bell pit workings and made into wrought iron. Nearer to Huddersfield at Bradley Wood, the Black Bed ironstone yielded ore of great economic value with 30% iron content. Iron Mining was important for about 200 years, but no ironstone has been worked since the 17th century. The other main mineral to be exploited was coal. Mining was started by the monks from Byland Abbey in the Flockton area, possibly before the 14th century. As well as the bell pit method miners also dug what were called day holes or day eyes. These were worked by tunnelling a near horizontal adit into the shales from the side of the hill to obtain coal. Often miners who worked bell pits also had their own day hole for domestic use. Later the introduction of mechanisation and deeper shafts increased the coal mining industry’s extraction of the mineral as it gave access to deeper seams. The coal seams at Huddersfield dip towards the east, concealed by younger rocks. One of the larger coal mines in the district was the Denby Grange pit, north of Flockton, where several shafts were sunk. The pit was worked for 150 years in thin seams less than a metre thick from which a large tonnage of coal was extracted. In 1778 a new lease from the Denby Grange estate enabled more shafts to be sunk nearby which included Caphouse Colliery, now the National Mining Museum for England. There are four main coal seams and a minor seam in the Huddersfield area between Lockwood and Castle Hill. The coals vary in thickness, hardness and sulphur content. These seams of coal were important in the past as they were mined by local people for domestic fuel. Industry also used local coal in the mills and factories for steam power during the industrial revolution. There were many pits in the Huddersfield area in the 1860s and as the coal was mined out new pits were opened. 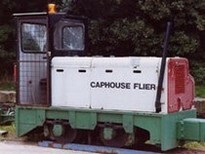 Many pits were individually owned, with few families or companies owning more than one pit at a time. An interesting account of local mining is given in the ‘History of Kirkburton’, written by Eli Exley in 1912. He suggests that mining began “many generations ago” and describes the extent of the industry between 1850 -1910. In Kirkburton there were over 30 collieries of various sizes, employing at least 300 local men, so mining was clearly a major industry. The coal seams are not f ar beneath the surface, so many of the mines were day-holes rather than shafts. Some collieries however had shafts, the deepest of which was St. Helen’s colliery, Moor Lane, at a depth of 50 metres. Coal mining became less important in the Huddersfield area during the first few decades of the 1900s, probably because the seams are generally thin. Deeper and more effective mines were opened further east towards Wakefield. A few small pits were worked in the Second World War, but only for local domestic fuel. 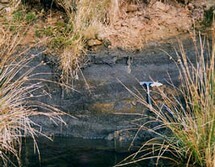 Coal seams rest on seat-earth which is either fireclay (mudstone) or a ganister (sandstone). Both may be used for firebricks. They contain numerous fossil roots, being fossil soils (palaeosols) without bedding or lamination. The coal seam itself is made up of layers of differing qualities. The bottom layer is usually softer than the rest, as it is mixed with some of the seat earth. The ‘middle coal’ (or ‘brights’ from its appearance) has less ash and burns well. The next layer, the ‘upper coal’, ‘hards’ (or ‘dull coal’), was valued as good steam coal. Resting on the upper coal is a layer of shale of varying thickness called ‘bind’. This forms the roof of the coal seam and is usually softer than the shale higher up. If the roof shale changes to sandstones it is usually an indication of the seam thinning. 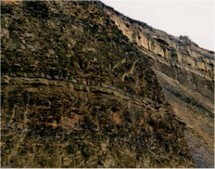 The roof shales generally contain many fossils which help to reconstruct the environment of the Coal Measures. Clay was exploited in this district for pottery manufacture, mostly from the seat-earths in the Lower Coal Measures. 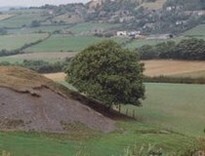 Suitable clay was found at Lockwood Scar, Lindley Moor and Salendine Nook. In the 13th and 14th century fireclay was worked at Upper Heaton, known at the time as Poter Heaton. 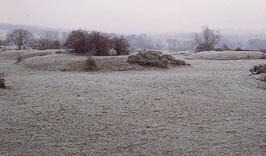 After the clay had been dug out, local river sand was incorporated to prepare it for pottery manufacture. The potters produced cooking pots, puncheons and jug s that were then traded at local markets. Kilns were built on nearby hills, taking advantage of the prevailing wind that increased the flue draught and so raised the firing temperature. The Morton family ran the Salendine Nook pottery for 300 years closing only in the 1940s.